Just wanted to check in with a quick update. Our first playtest should be next week. We're finishing up the last of the counters. We're going to play the Dobrogean Campaign--the initial Bulgarian-Turkish-German invasion of the Dobrogea at the beginning of campaign. It's a good subject because it has most of the nationalities--two river crossings of the Danube, fortifications, naval and air. Here is a picture of the initial set up. The arriving Russian and Serbian troops are not on this photo, nor are the supply markers (for clarity). The initial set-up is finished--some changes will come out of the play-tests for sure. That is very kind. It still needs some work to make it more player friendly! Roads and rails need to be more prominent and the terrain colors a bit more subdued. It's also hard to see the hexgrid in the mountains. I would very badly like to use 19mm hexes instead of 16mm, which are very small. I may make the map bigger for the play-test to see how it sits on the table. Perhaps a white hex grid in the mountains? Millimetres, not inches, is used? Yes, I've considered a different colored hex grid. I'll give that a try also--plus the terrain is just too dark. It looks different than on the computer. I'd really just like to convert over to a larger hex size. Right now they're the same size as in TitE which is a tight squeeze. Yea, large hexes are really appreciated. especially if you're an old guy like me! Dont change the map too much........... IT IS AWESOME !! Thank you. It is perhaps not the most functional at the moment as it's taken straight from raw GIS data converted into vector shapes. This gives it a nice "real world" look from afar, but would lead to many, many questions among gamers of "is this clear or rough?" So, I need to "hexify" the terrain somwehat. This is the shame and the limitation of the hexgrid as regulation of movement and placement. In a prefect world we would have something better. Just a picture of the updated map. 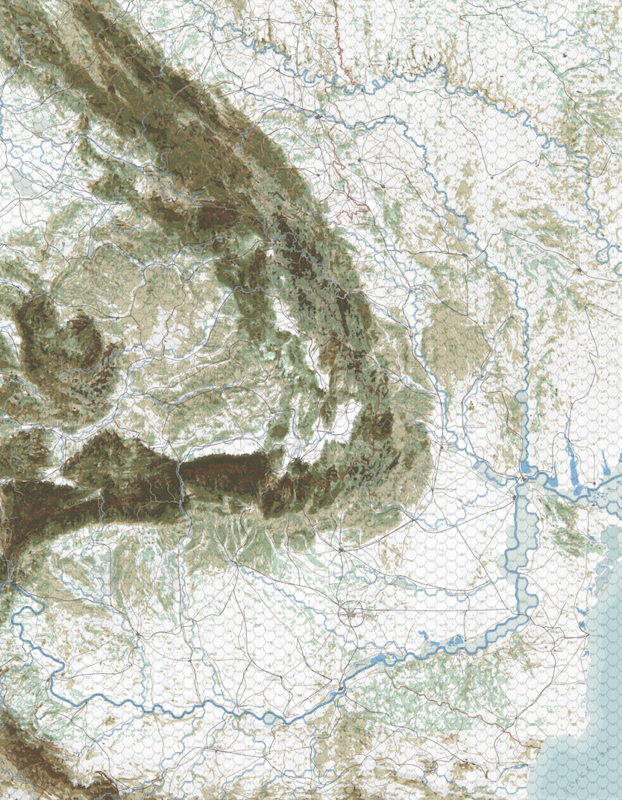 Not changed too much, but the hex grid is darker and I've defined the terrain colors some to make the contrast more. The map is ready for our next play-test. I've also added the hex grid to the Black Sea area as well, as there will be some naval units, and I think this will be necessary. I've almost finished the German units--the last I needed to complete. They were by far the most complicated. The units involved go from the best (The Alpenkorps) to the worst (217th Infantry) so it is a very interesting mix of forces. The mountain warfare aspect of the game will be important, as it's how the Romanians blocked the passes for two months, and in the end how the Central Powers broke the stalemate. On the Eastern side of the area the Russians also had mountain units and there was some savage fighting around the Kirlibaba area. I really like the mixing of the proficiency rating from OaO/SmS and the combat and loss systems from TitE. They seem to work well together and it's simple--the best part! I may have to go back and mark some of the units with a symbol as "unsupported" meaning they has no artillery at all. Many of the Romanian units have a small amount of artillery that doesn't add up to even 1, but not penalizing them for the unsupported modifier would be a good way to show this. Things are coming along, and I am very happy with the game so far. Sidan skapades på 0.079 sekunder med 19 databasfrågor.